Harry Payne was a blacksmith-farrier who worked in Pamell at E & H Craig who were in the business of hiring out working horses, including those used by the Sugar Co at Chelsea. Harry and his wife Margaret lived in Oliphant Street, now a part of John Street in Ponsonby. They had 3 sons, Alt, Ron and Jack. The family enjoyed fishing and were always owners a small boat or two. Each summer they went to Point Chevalier for a camping holiday and all their camping gear was carted there by a two horse team belonging to A B Wrights. This was in the-early 1920's before the suburbs of Auckland had spread out as far as the Point but when the houses began to be built closer to their favourite holiday spot the family decided to try camping at Shark Bay. For many years, among the boaties of Auckland, Kendall Bay was known as Shark Bay. An appropriate name as Maori history describes the area as a fishing village from where canoes set out to catch shark. The flesh was dried and stored as a valuable food supply. It was the late 1920's and early 1930's, Depression Years, when the Payne family for several summers spent the 6 weeks of the school holidays at Shark Bay. Jack was about 7 years old when they first camped there. Ron was 10 and Alf 17, and these are Jack's memories. About this time, Harry decided to have built, a new and larger boat. Clinker-built from Kauri, 16ft and able to be used with a gaff-rigged sail or an outboard motor. They named her "Margareta" and kept her moored off Curran Street, Herne Bay. This was before the breakwater was developed into Westhaven. Usually there were 7 or 8 other families enjoying their holidays at the bay and some of them would join together to hire a barge to be towed across the harbour with all their gear and supplies on board. All the land around the bay which now forms Kauri Point Centennial Park was at that time owned by the Auckland Harbour Board and each summer the families gained permission from the Board to camp there. 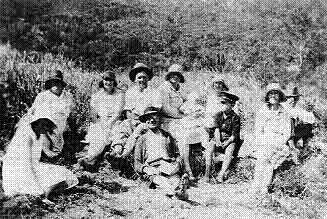 Some of the campers at Kendall Bay in 1930. Young Jack Payne in the peaked cap. Harry Payne would sail across a few weeks earlier and clear the site ready for his family, tents. 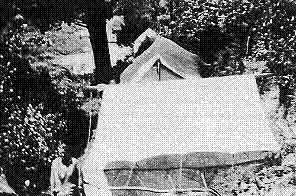 They were well equipped with 3 ridge pole tents, each measuring 16ft x 10ft (i.e. approx - 5 x 3 metres). One tent for the parents, one for the boys and a third for a long table and forms. They would often seat 12 for a meal when friends and cousins joined them. A large canvas fly with loose screens was added to the dining tent to form an area for cooking and they even had a cast iron stove called a "Bonny Bridge Dover". It had a good oven and stood on cast iron legs and each year it was dismantled, wrapped into parcels for carrying, and then re-assembled at the camp. All the gear was stowed in the boat for the trip across the harbour. Included would be the treats in the hamper their mother bought each year with her savings in the grocer shop Christmas Club, as Christmas was always celebrated at the bay. They made their camp at the western side of the bay where there was already an area levelled into a terrace beside a little stream that branched to the west of the wetland. Most of the other families chose tent sites near the main stream that flows down from the back of the wetland. It was important to be close to a good water supply and normally the water was so clear that the boys would just lie down, put their faces in the water and drink. There was a pool in the stream and plenty of little trout that would swim up to watch them drinking. Most households back then used kerosene, mainly for lamps, and the empty 4 gallon tins came in handy for many purposes. They were tins with a square top & bottom and with the top cut open and a wire handle added they made good water carriers. If it started to rain at the camp all the children were sent off, each with a kerosene tin bucket to fetch water from the stream before it was made cloudy by the run-off. In those years, a great deal of the tea-tree that grew in the area surrounding the bay was only about head high. A lot of hakea shrubs grew amongst it and Jack remembers collecting the branches full of the heavy seednuts as they made excellent fuel for the stove. There would often be about 8 youngsters from the camp all off together with some purpose in mind. They would sometimes build a bush hut with forked tea-tree for corners and tea tree brush walls. They used bundles of raupo for the roof and when finished it was snug enough to sleep the night in. A few times the boys would walk over to Highbury to buy meat and bread and sometimes milk. Nearly all the way was just through tracks in the bush and if it rained it wasn't easy getting back down steep tracks balancing a billy full of milk. The meat was only for a change as there was usually plenty of fresh fish for a meal, mainly schnapper or gurnard caught near the reef from the boat. When the shop bread was finished, soda loaves were baked in the cast iron oven and good they were too. There used to be a passenger wharf at Chelsea that was built for the ferries that brought the sugar workers over from the City. Several times a day the Birkenhead ferry continued on to Chelsea. After their two weeks annual holiday came to an end the camp fathers walked a bush track to and from Chelsea each day and caught the sugar workers ferries going the other way. Back at their work on the City side they looked forward to coming home to the Bay each evening and weekend. It became a custom for the families to meet together after dinnertime each day in a big sandy hollow behind the beach where there was always shelter from any wind. A time to enjoy each other's company and swap the news of the day. Often followed by a sing-along until the summer night closed in. Some of the family names of the campers were McKenzie, Harvey, Rose, Beazley, Goodwill and Killip. There was also a family who camped at the other beach near Kauri Point but they liked to keep apart from the main group. It was not unusual for a youthful romance to begin at the bay and Jack's older brother later married a Goodwill daughter. Between high tides a golf course was often laid out between sandbanks on the beach and a tournament with a fun trophy was one of the summer's highlights. Empty peach tins were sunk into the sand to form the holes which were then marked with tea tree stakes. Only golf clubs cut from the bush were permitted. There were no expensive golf balls allowed and just small rubber balls were used. A lot of fun was had by all, till the tide came in again and washed all away. Jack remember the time his father decided to take some photos of the new boat he was so proud of. He persuaded his sons to sail the "Margareta" back and forth many times across the bay while he balanced on some rocks with his "Box Brownie" camera, using up a film while trying for the best shot. It wasn't till later that it was discovered that except for one time he had forgotten to wind the film on. One of the favourite places for the lads to spend the day was around the shore to the west at what they called Sprat Bay. They didn't need to take drinks or cut lunches as they had a frying pan and fireplaces were cut in the rock. The boys caught fish and cooked it in seawater. If they needed a drink they looked for a place on the cliffsides where the moss was green, and using a sheath knife, (which was in those days a boy's most precious possession), they would cut a v shaped channel in the rock face for water to collect and then poke a grass straw in to form a trickle and drink from the end. They also learnt well how to handle a boat and how to swim like fish. Sometimes one of the 'Blue Boats' would pass by on the way to the wharves further up the harbour. Another large group of families used to camp near the Onetaunga wharf. On public holidays they would often see a Harbour ferry, with a brass band playing on board, taking picnickers to spend the day at Pine Island (as Herald Island was known then). In those days, when very few people owned a car, many companies used to treat their employees to an Annual Picnic usually travelling by ferry to one of Auckland's islands, and very popular events they were. In the December of 1934 when the camping party arrived at the Bay, they were dismayed to find a wide belt of clearing cut through the bush where a pipeline had been laid to bring water from the Waitakeres to Birkenhead. It ran from the beach in a straight line up the long slope of hill behind the tent sites to what appeared to be a large gap in the once familiar tree covered horizon. Part way up a new pump shed had appeared on the scene. There was a tap there that proved hazardous to drink from as the water came through pulsing and full of air. It seemed as if the Bay had been cut in half and spoiled. The Payne family decided to make that summer their last at Shark Bay. By the next summer the Defence Dept had taken over the Park Reserve that had included many acres of land surrounding Onetaunga Bay and so the days of camping holidays around our shores came to an end as the war years soon followed these times. All these decades later, though now living at Waiheke, Jack has very fond memories of those boyhood summers and recently made a pilgrimage back to the Bay. Several members of his family, including two great grandchildren made the journey with him. Two of his sons, John and Patrick, arranged for all to meet at Birkenhead Wharf, where they had ready John's boat, which had been brought down from Kamo, as Jack had a longing to arrive by boat like they always had done in the past. 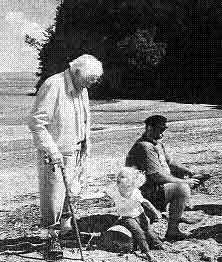 Jack Payne, his son John and one of his great-granddaughters on the day we had the pleasure of meeting them and other of their family at Kendall Bay. Today of course with our two Reserves being classified 'Scenic Reserves' under the Reserves Act, all camping, lighting of fires and taking of the native vegetation is against the law. But this also means that instead of these places being accessible by only a lucky few, all of us can now enjoy time spent in these beautiful surroundings.